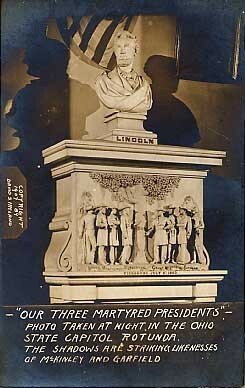 President Lincoln Capitol Ohio RP - Abraham Lincoln - Presidents and Political - Vintage Postcards | VintagePostcards.com: vintage, old, antique postcards for collectors. Lincoln's monument in the Ohio State Capitol Rotunda. The shadows are striking likenesses of McKinley and Garfield. 1907. Copyright by David S. Ireland. Bust, horse, real photo.